If there is one dessert that is an absolute must in your repertoire, this is it. Literally translating as 'Cooked Cream', Pannna Cotta is easy, elegant and requires minimal ingredients. What's even better is that this is a dessert that needs to be prepared ahead. Once you have nailed the basic recipe, there are endless variations that can be brought into the Panna Cotta itself or the accompanying sauce. That said, for a real quick version, you don't even need to whip up a sauce. The dessert goes incredibly well with some simple macerated strawberries and I personally think it looks and tastes better with fresh berries. The only thing to remember is that while the Panna Cotta should be set enough to be unmoulded, it should still retain a bit of the wobble. We are looking for a smooth, melt in your mouth texture rather than a chewy, jello like one. (I must confess at this point that I rarely unmould a Panna Cotta while serving. I prefer the unmoulded look, not to mention that it saves time.) This undoubtedly is dependent on the gelatin that you are using and it might take a couple of attempts to get the perfect texture. I have given the quantities for making Panna Cotta with 1 cup of cream for ease of scaling up. This makes just about 3 servings (I divide between 4 shot glasses if it is just the two of us - but that makes small portions.). Do scale up the recipe as needed. Vanilla Extract - 1/2 tsp. or to taste. Strawberries, washed, cleaned and sliced - 3/4 cup. Leave the gelatin to soak in the milk for about ten minutes or until it plumps up well. After that, combine the cream and sugar together in a sauce pan and heat up. Stir constantly and switch off once it warms well. Do not let the mixture come to a boil and take special care not to scorch the mixture. Take the sauce pan off the heat, add gelatin and stir well so that the gelatin dissolves completely. Add the vanilla extract and once the mixture cools down, pour it into moulds. (Remove any foam that might be there on top of the mixture with a spoon if you want an even top for the dessert. It is also easier if you pour the Panna Cotta into moulds near your refrigerator so that you won't have to carry it here and there causing spills and splashes inside the top bare portions of moulds.) Keep the moulds covered and set for at least three hours. Simply combine all the ingredients mentioned and leave it for 30 minutes up to an hour or two. (If you leave them for too much time, the berries will become too limp and might also change colour.) Stir a couple of times in between. To serve, top the moulds with the berries along with the juices that must be oozing from them by now. If you are unmoulding, dip each mould in hot water for a few seconds, wipe the water off with a clean cloth, invert onto a small plate and then garnish with the berries and their juices. If you are planning to unmould, metal moulds are the easiest to work with although glass will work fine too. I know it has been months since I left that last blog of mine. While I did intent to take a break from blogging as things got somewhat stale and boring, the move to a new blog, the purchase of this domain name and the outrageous way of neglecting this place were totally unplanned. Curiously however, I never stopped working on the various components that make up this blog of mine - from to collecting props to working on my photography to fine tuning some recipes - everything had gone on more or less as before, except that the platform onto which all these must have gone in remained relentlessly neglected. Anyway, that is enough dithering for a first post! Let's talk about the recipe now. 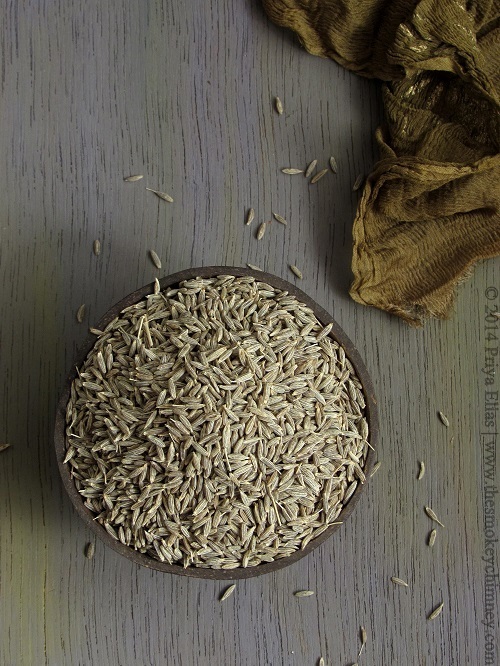 I have always begun my blogs with one of my Mom's recipes and I was determined that it will be no different this time. 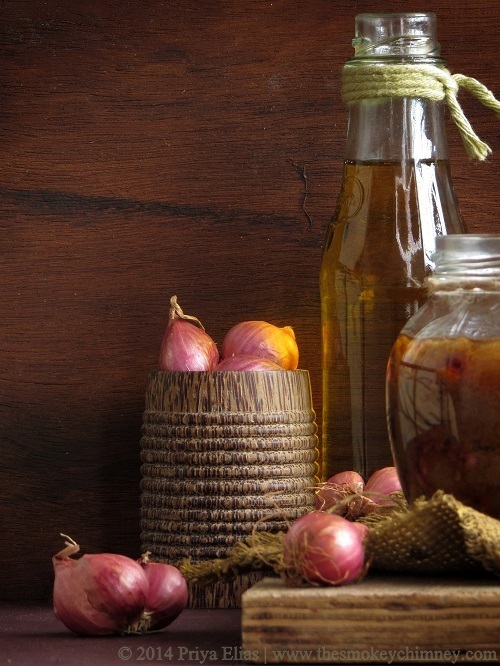 This recipe for pickled shallots is something that I found in my Mom's old recipe book. 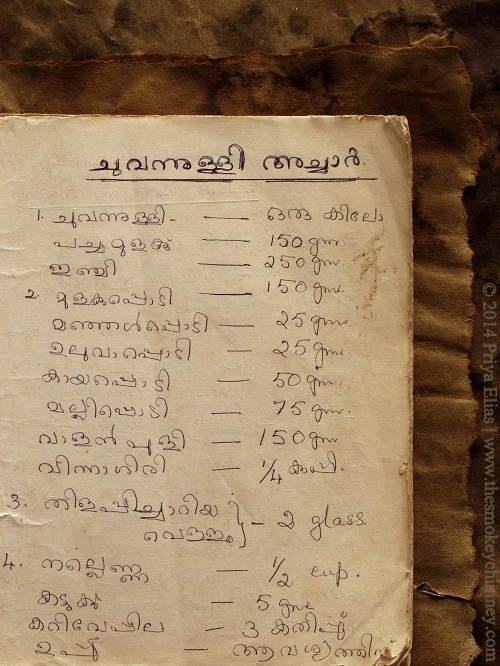 In fact, this is the first recipe in that old and tattered blue bound notebook that she had left behind for us. The measurements in her book are usually in metric or in even older systems and it is something that I have to tinker with when I'm working on her recipes. May be I should buy a kitchen scale rather than resorting to conversions. Or may be not, since cup measurements are I feel, more convenient. 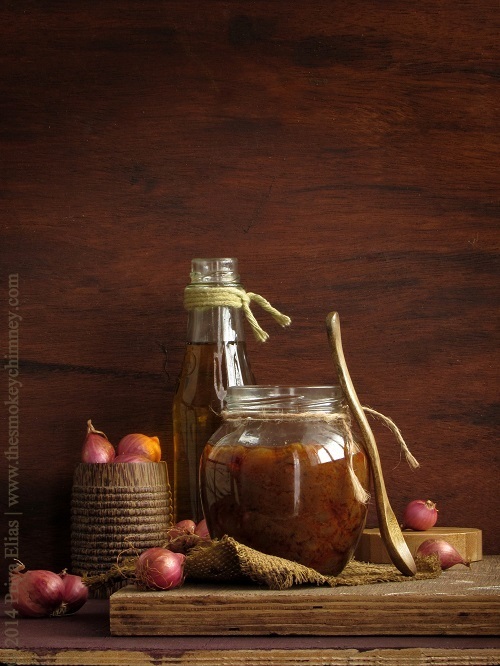 In any case, I have converted what was a pickle recipe for a kilo of shallots into one for just two cups of shallots. (Do note that this makes a small quantity and I make it this way since The Techie will not touch vegetarian pickles at all.) In addition to scaling down the recipe, I have omitted the coriander and slightly deviated from the method jotted down by her. Nevertheless, the pickle turned out really well and I hope it will do for you too. Fenugreek Powder - 1/4 tsp. Asafoetida Powder - 1/8 tsp. Mustard Seeds - A generous 1/2 tsp. Ginger, julienned - 1 tbsp. Green Chillies - 2 or 3, cut into two or three slices. 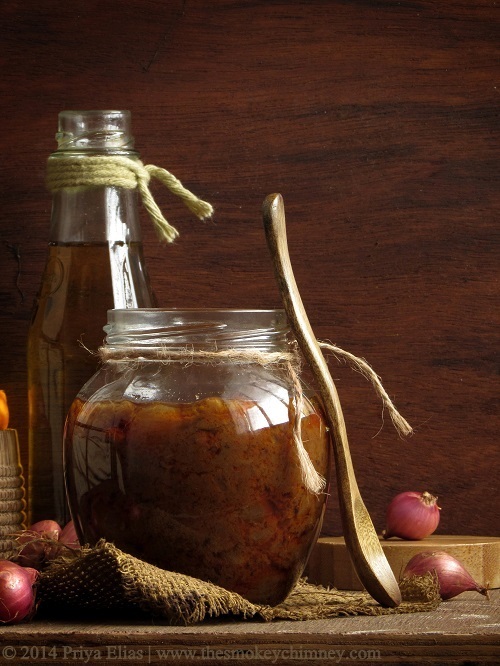 Tamarind Paste - 1 tsp. White Vinegar - 2 tbsp. 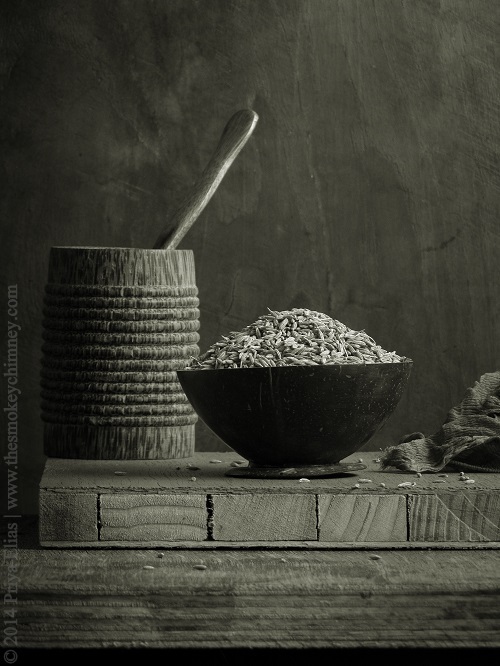 Jaggery, grated - 1 heaping tsp. Water - 1/2 cup, boiled and cooled. + enough to make a thick paste out of the powdered spices. Heat up a pan and add a tablespoon of gingelly oil. When the oil gets heated through, add the shallots and saute them. Stir them around once in a while till the outer skin begins to take a brownish shade. Take care not to burn them. Keep aside to cool. Add enough water to make a thick paste with all the spice powders except asafoetida and keep it aside. In the same pan that was used to saute the shallots, add the rest of the oil and heat it up. Add mustard seeds and allow them to sputter. Now add the ginger and stir around for a few seconds. Follow with the green chillies and curry leaves and saute them for a few seconds. Now add the ground shallot paste and saute till oil can be seen glistening on the surface of the paste. Add the paste made with the spice powders and stir around. Take care not to burn. 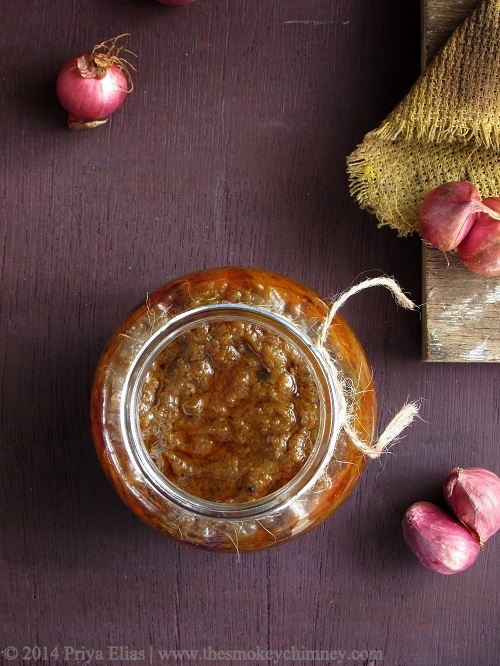 Stir frequently and when the oil separates, add the tamarind paste, jaggery, water and salt. 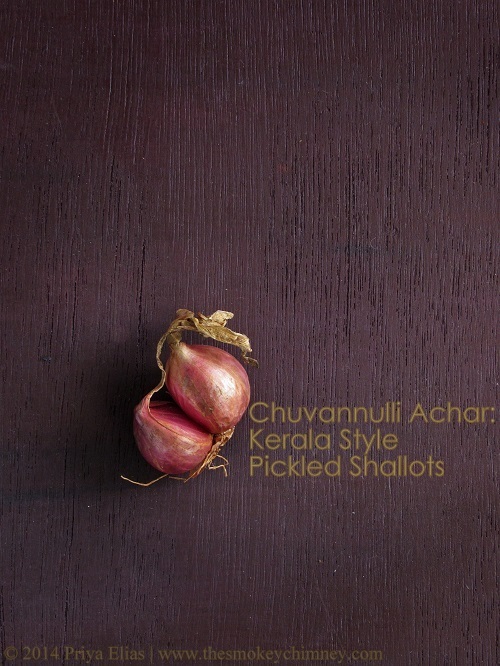 Bring the gravy to a rolling boil and add the shallots that have been kept aside followed by the powdered asafoetida. Stir to coat. Keep the gravy on a simmer for a couple of minutes and then switch off. Allow the pickle to cool down and then transfer to a clean jar. As it rests, the oil from the gravy will float to the surface forming a protective layer. Allow the pickle to rest for a day at room temperature before refrigerating and/or using it. The amount of shallots to be ground is a personal choice. I prefer a lot of gravy with less of whole shallots. My mother's recipe leaves more whole shallots in the pickle. You can most definitely adjust the amount to your taste. Though the pickle can be kept at room temperature for a few days, it is better to keep it in the refrigerator especially if you have hotter climates in your area.